Families who welcome promising young players from far and wide. Quirky hockey communities born in the heartland. Is this teenage hockey heaven? Nah, it’s Nebraska. Deb Andersen wasn’t so sure she wanted to welcome a strange teenage boy into her home. The whole crazy idea had been her neighbor’s fault, really — when Deb and her husband, Tom, moved into a ranch house in Kearney, Nebraska, a little over five years ago, they found themselves next door to a huge fan of the town’s local United States Hockey League team, the Tri-City Storm. His enthusiasm was infectious. Tom began accompanying him to games, and the next thing Deb knew, her husband was suggesting that they open their house to one of the Storm’s players — some of whom had yet to graduate from high school — for the nine-month season. For so many top young hockey players, being the best in your local community means it’s time to leave it. Each year, guys as old as 20 and as young as 151 fan out to fill junior hockey rosters across the U.S. and Canada, from the Halifax Mooseheads to the Saskatoon Blades to the Tri-City Storm. Occasionally a phenom 15-year-old is invited to play: In the CHL, for example, John Tavares (and current Canadian wunderkind Connor McDavid) were granted “exceptional player status.” In general, though, the youngest players are 16. Players who go through junior have one thing in common (other than a hockey obsession): They need somewhere to live. That’s where folks like Tom and Deb Andersen come in. Known as billet2 families, people like the Andersens take in one or two players a season and become their de facto parents. There are certainly exceptions to this path. Some players — particularly those who attend Minnesota high schools, New England boarding schools, or hockey factories like Notre Dame or Shattuck–St. Marys — go straight from high school to college to the pros. This was the path taken by players like Jonathan Toews, Jonathan Quick, and Chris Higgins. Others, like Ryan Kesler, live in Ann Arbor and play for USA Hockey’s National Team Development Program during their teenage years. Kesler went on to spend a year at Ohio State before turning pro. The word comes from the centuries-old wartime practice of housing soldiers in civilian homes. This wasn’t exactly popular — see the Petition of Right or the Third Amendment — but when it comes to hockey, it’s a bit more voluntary. By and large, though, whether you have legit NHL ambitions or just hope to nab a college scholarship, the way there is almost always through junior. Even anticipated hotshots like Steven Stamkos and Sidney Crosby, both of whom joined the NHL at 18, spent two years apiece at that level. In Canada, three leagues3 and 60 teams comprise what is called “major junior,” unquestionably the most elite tranche of under-20 hockey in the world. In the United States, the top circuit is the United States Hockey League, or USHL, a 16-team collective whose most distinguishing feature is that it is designed to preserve players’ NCAA eligibility as amateurs. The USHL has existed in some form or another since 1947, and has included the NTDP Under-18 team under its umbrella since 2009. The Tri-City Storm has been part of the league since 2000, before which the franchise was located in Minnesota and named the Twin Cities Vulcans. 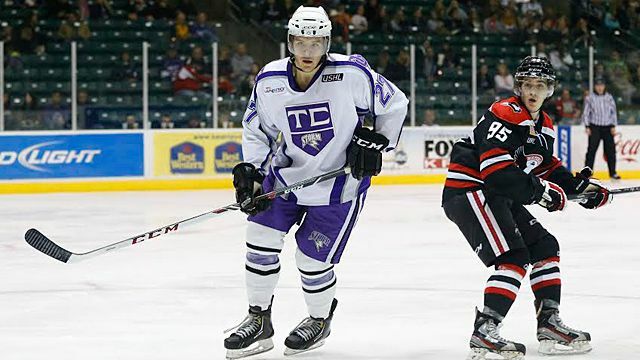 The team is one of three USHL teams in Nebraska, and it plays in the league’s smallest market. The Western Hockey League, the Ontario Hockey League, and the Quebec Major Junior Hockey League. The year he played for them the team was located across the Missouri River in Council Bluffs, Iowa, and was called the River City Lancers; after two seasons they went back to Omaha. The billet families feed the players and act as their occasional chauffeurs and tiptoe around their mood swings; they give them lots of privacy and space (in many billet houses, players get undisturbed reign over the basement), but also can’t resist swooping into the boys’ bedrooms to deal with the laundry situation while the team is on the road. Really, what parent could? It was Zombie Night at the Viaero Event Center, a 5,000-seat arena just off Interstate 80 in Kearney, where the Storm have played since their first season in 2000. Weeknight contests like this one — it was the Wednesday before Halloween — are a notoriously tough draw. The league tries to schedule most of its games on Friday and Saturday nights, both to mimic the NCAA schedule and for logistical and financial reasons. To be sure there’d be sufficient zombie representation, the team reached out to a tried-and-true, always-up-for-it contingent: frat boys. The Storm had been playing like zombies themselves to start their season, and the team was increasingly hungry for goals. Tri-City lost to both Lincoln and Omaha on the road just a few days before Zombie Night, and the pressure was on: Team owner Kirk Brooks, who bought the Storm and the arena for $4 million in 2009, was in town from his home in Las Vegas to see things for himself. Kenny played on the team for three seasons and lived in billet homes the whole time, “just like any other kid,” his dad said. He’s now a freshman at Penn State. At one Friday-night Storm game, Brooks had a Penn State game playing on the TV in his suite and a Colgate women’s game on his laptop. “When Kenny was here [on the Tri-State Storm] and we had [St. Louis Blues forward] Jaden Schwartz … it was just the best thing in the world in my eyes,” Brooks said. The home ice of the Omaha Lancers, who hold more Clark Cup victories than any other team, is the shiny Ralston Arena, which opened in 20126 and had signs for a Wynonna Judd holiday concert and a Bill O’Reilly speaking tour hanging at the ticket office. Across town, the University of Nebraska-Omaha Mavericks play college hockey in the too-spacious CenturyLink Center, though the university is planning a nearly $80 million new arena for hockey, volleyball, and basketball. The Tri-City Storm play about a two-and-a-half-hour drive west of Lincoln, smack dab at the continental midpoint between Boston and San Francisco.7 On your way there you earn a new appreciation for cruise control and pass under the Great Platte River Road Archway Monument, an ambitious museum that commemorates Kearney’s place among the great American tales of westward expansion and is currently struggling through bankruptcy. The team is the USHL’s westernmost market; the league’s snug borders are also defined by Youngstown, Ohio, to the east, Indianapolis to the south, and Fargo, North Dakota, to the north. On Zombie Night the team briefly reanimated. The line of Christian Horn, Daniel Labosky, and Joel L’Esperance combined for three goals and six assists, goaltender Jacob Johansson8 made 34 saves, and the Storm skated away with a much-needed 4-2 win. And the collegiate zombie mercenaries stumbled into the cool Nebraska night fully sated. Each USHL team is allowed four “imported” non-American players; Johansson, a 20-year-old from Sweden, is one of Tri-City’s. The following night, I went over to the Hilkemann house, where 18-year-old L’Esperance, a Michigan Tech recruit, is now spending his second USHL season. All around the tidy, modest neighborhood, children in costume gathered on their front lawns — a tiny elephant here, a tweenage Miley Cyrus there — having their pictures taken and asking their parents if it was time to trick-or-treat yet. I spotted more than one scarecrow propped up on a porch and outfitted in a red Cornhuskers football jersey. At the front door of the house was a waggly Labrador named Harley. Up in the kitchen, Michelle Hilkemann was making dinner for her three boys — Evan, 9; Austin, 15; and Joel. Evan, a blond sprite with a grin that spans the width of his face, disappeared into his bedroom and presently emerged as a ninja. With his bo staff he harassed Joel, who reacted with the affable nonchalance of a guy who grew up in an enormous family — he’s the seventh of 10 kids, and the youngest boy — and is used to low-level, loving abuse. The vibe was warm and hectic and yet completely low-key; I could have hung out on the sofa for weeks. The family members took turns answering the ringing doorbell. They built a makeshift barrier out of two tall stools to keep Harley from bounding down and back up the staircase by the front door. Evan and his father, Brian, left to go collect candy themselves; a few minutes later, Brian popped back in to deposit something in the fridge. A Popsicle? No, a neighbor was handing out corn dogs. About a minute before Michelle drove Austin to his own evening ice hockey practice — a freshman at Kearney High School, he plays forward and has three goals and three assists through seven games — Harley’s enthusiastic hindquarters knocked over one of the stools, which came down on his front paw. The dog limped around, trailing blood on the wood floors. Joel and Michelle serenely collaborated on cleanup. “Well!” she said brightly as I sat with her at a Storm game the next evening. “You said you wanted to see a day in the life!” On this night, the whole family was in the building: Austin was working at a concession stand, Evan was running around the arena halls with a wild pack of young boys, and Joel was picking up another assist in a 3-0 Storm win. Following the final buzzer, locals flooded the ice for a Storm postgame tradition: a community skate. Grown men in jeans and rental skates made like Bambi. Munchkins toddled by clutching special sleds designed to keep them upright. Teenage girls side-eyed the Tri-City players and tried to look cute. A woman pushed a boy in a wheelchair. 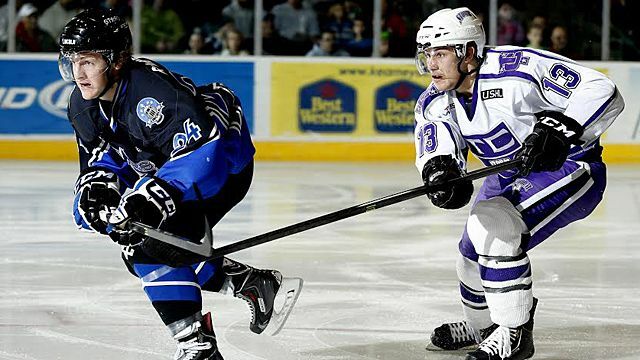 Evan zoomed around and periodically sweet-talked Storm players to skate around at high speeds with him in their arms. I remarked to a team employee that this was such a nice thing for the organization to do. “It goes a lot better after a win,” he said. That night, the Kearney High had lost in the playoffs, falling 27-16 in the tournament’s first round. A few Storm supporters admitted they were secretly, guiltily glad: Having Kearney High football going deep into the postseason would be bad news for ticket sales. Hockey participation has been essentially flat in Nebraska over the past decade, but it has tripled when compared with the early ’90s. Many billet families started out as fans, and some have become players themselves: Both Hilkemann boys now play on local teams, and Tom Andersen recently bounced back from triple-bypass surgery by signing up for a Hockey 101 program and has since graduated to a local men’s league. 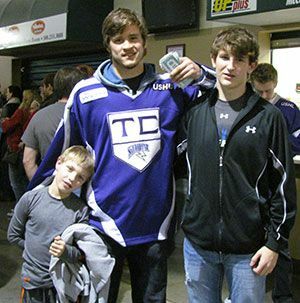 It took a few years of mulling it over, but the Hilkemanns finally became a billet family for the 2010-11 season. Brian, a full-time member of the Army National Guard, had been deployed to Baghdad in 2009; while he was gone Michelle was diagnosed with colorectal cancer. Last season, Joel suffered his first-ever major hockey injury, breaking his wrist. It was a home game, so the Hilkemanns shuttled him straight to the emergency room, where Michelle stayed by his side. When he had surgery a few days later, she was there the whole time. They joked that they could share pain meds when they returned home. Michelle had just started a new round of chemotherapy. Her cancer had returned, and had spread to her bones. We all have our routines, and Jennifer Turek is no different. Each season she greets the player who will stay under her roof with several presents: the key to her home, a Nebraska T-shirt (“Good old Cornhuskers!” she said), and a purple tie. At Tri-City Storm games she wears a sweatshirt with the team logo and the words HOUSING PARENT underneath, as well as two buttons boasting the photos and numbers of Austin Poganski and Kevin Kerr, her current charges. This is her seventh season as a billet mom, and her sixth as the program’s coordinator. She juggles her role along with her full-time job at a local credit union. Families who sign up to billet go through a background check, speak with the coaches, and have their homes visited to ensure that the players will truly have a space — and a bathroom — to themselves.9 Some families don’t want goalies (too headcasey) or high schoolers (too young). Some are empty nesters who want some bustle back in their lives. Others have children who idolize the new guy living in the basement or spare room. When St. Louis Blues captain David Backes, the youngest in his family, was billeting in Lincoln with police officers Todd and Teresa Hruza in 2002-03, he suddenly acquired younger siblings — 3- and 5-year-old boys. Having high school–age daughters, though, is a deal-breaker. Turek roughly estimated that about 20 percent of applications over the years had been declined, though at this point there is no waiting list and some families like hers house two players. Storm rules dictate that the players are required to call and introduce themselves and make the first contact early in the summer. (“That is one of the most special phone calls,” Michelle told me. “I try not to make them suffer for too long.”) Every house has its own rules and customs; word gets around between the players who’s strict and who’s the best cook and who has the best setup for watching hockey or playing video games. At the Tureks’, the boys are required to spend one night a week hanging out with Jennifer and her husband. Turek recalled that one year all the billet families got together and had a bunch of “minute to win it” games — stacking cups the fastest, that sort of thing — that brought out all the worst of the players’ competitive instincts. “The boys were driving me nuts,” she said, shaking her head. “They weren’t following the rules, they were trying to do anything in their power to cheat and get ahead.” Now the get-togethers revolve mostly around big potluck meals. And the meals! Teenage boys are already notorious for their ability to eat their families out of house and home, but throw full-time hockey into the mix and they become downright garbage disposals. The billet families receive a $200-a-month food stipend from the team, but it only goes so far, and most of them end up splurging. Garrett Gamez, who lives with the Andersens, said, “Tom’s always buying steaks or fish or something like that.” Tom laughed when he heard that, and admitted that his wife had rubbed off on him (in a good way). As with all human interactions, some billet relationships end badly; I heard of one player who was moved because he wasn’t bulking up enough on his interim family’s cuisine. Deb Andersen decided she wanted to join the Army Reserves for much the same reason that she decided to be a billet mom. There were other rationales, too — she was going to school later in life to get her nursing degree, and there was excellent tuition reimbursement through the military. Her husband had been a reservist himself for 16 years and thought she’d be a great fit. But mostly, it was about taking care of someone else’s child. When I met Tom, he was decked out in a Storm jersey with LIEDES on the back — as in Heikki Liedes, a Finnish player who lived with the Andersens for two seasons and is now playing in the Liiga, Finland’s top professional league. Last season, one of Heikki’s friends on the team, Garrett Gamez, a forward from Southern California who has a missing front tooth and a commitment to play at the University of Denver, came over to the Andersens’ house quite a bit (their backyard Jacuzzi is a popular amenity) and everyone hit it off nicely. He requested to live with them this season and Turek and the team saw it as a great fit. Shortly after the housing decision was made, Deb got a call from the Army: She would be mobilized for nine months. She barely had time to make arrangements before she got another call saying that plans had changed and she no longer would have to report. She was relieved, but remained on pins and needles, suspecting that a third call couldn’t be too far behind. She dreaded each ring of the phone. The Army wanted Deb at Fort Dix in New Jersey in three days. She negotiated the timetable to six weeks. In the meantime, Garrett arrived as had been planned. And just as Joel L’Esperance had responded when Michelle Hilkemann told him that she had been diagnosed with cancer again,12 Garrett had no interest in a change of plans. Youth hockey is an increasingly immersive and expensive world. Limited ice time means practices at 5 a.m.; far-flung teams mean nine-hour bus rides. By the time players reach a level like the USHL, holidays like Thanksgiving and Christmas have long been celebrated in rinks and hotel rooms.13 This isn’t unique to hockey, but compared with other sports it can seem accelerated: That strong sense of community gives way to a kid leaving home at 16 or 17. Kirk Brooks identified the latter as his biggest challenge as a hockey dad himself. “I can still remember [Kenny’s] squirt coach saying, ‘OK, we’ve gotta be in California on December 26, so you’ve gotta leave on the 25th,’ and I was like, When hell freezes over. It went from that to every holiday — Thanksgiving, Christmas — we were traveling.” The Brookses even temporarily relocated to Colorado so their daughter, who had grown up in Las Vegas playing on boys’ teams, could play on a girls’ team and be scouted by college coaches. She now plays at Colgate. 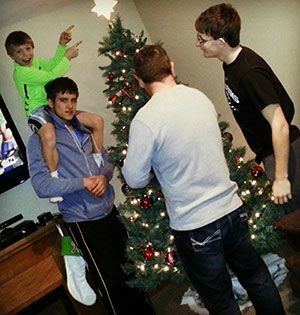 As junior players, the boys can find in their billet families more than just interim moms and dads; the relationship is more like the kind you’d have with a beloved grandparent or favorite uncle and aunt. Not everyone experiences lifelong closeness, of course, but the ones who do tend to fall hard. When Scott Niedermayer was inducted into the Hockey Hall of Fame earlier this month, he made a point to personally thank the billet families he stayed with in junior when he was playing for the Kamloops Blazers of the Western Hockey League. San Jose Sharks forward Logan Couture surprised his former billet parents with tickets to the 2012 All-Star Game.14 And Backes either travels to Lincoln or hosts the Hruzas for some games in St. Louis every year. His billet mom, Patty Dowsett, passed away this summer after a long illness. Before Deb left for her year at Fort Dix, Tom and Garrett took her out to dinner in town. When they walked into the restaurant, all the billet moms were assembled. Michelle Hilkemann had helped organize a surprise good-bye party. The Storm started a new tradition at the first game of the season: a patriotic salute to a chosen service member. Deb was the first honoree. She got a standing ovation from the 3,250 in attendance, and the players skated out of their huddle to bang their sticks on the ice. They beat the Lincoln Stars, 2-1. The next day, she backed her car out of her driveway (“That hurt, that really hurt,” she recalled), drove to Omaha to visit her mother and some other family, and then continued all the way to Fort Dix. And so it goes. Michelle spends most of her free time at the Viaero Center watching all three of her boys: Evan has moved up from mites to squirts this season and was a little too proud when he took his first penalty, Austin is playing for Kearney High, and Joel leads the Storm in scoring with 14 points in 20 games. Deb was placed in the immunization department in Fort Dix. She FaceTimes with her husband and Garrett whenever she can. She’s also been named chair of the social committee. You can see why they’d think that: The first thing she did when she answered the phone, almost before I’d introduced myself, was gush about how gorgeous the turning-red maple trees on her Army post were at this time of year. She got a few days off around Thanksgiving, and saw the Storm play twice while she was home. Garrett’s family — his other family — was in town for the holiday, too; they flew from Southern California to Denver and then made the five-hour drive to Kearney. “Everybody’s gonna have a feast at my billet house, so that will be great,” Garrett had told me a few weeks before Thanksgiving, smiling in anticipation. When I mentioned this to Deb she’d clearly not yet been informed of this plan — teenagers! — but was thrilled at the idea. Ultimately she hosted a dinner that included members of her, Tom’s, and Garrett’s families — three halves of a whole. It was, as it turned out, another farewell feast. Right around Halloween Tom accepted a dream job offer; the only catch was its location outside Chicago. He agonized about leaving in the middle of what had already been a tumultuous season for Garrett, and he and Deb talked about what to do. They decided to rationalize it this way: Like a hockey player, Tom had gotten called up to a better league, simple as that. “I told Tom, ya know, these hockey boys, they know the comings and goings,” Deb said. “They know that. That’s their lives. They’re with these billets for nine months, then with the next billet for nine months, then maybe they get cut — they’re just used to the comings and goings of people.” Garrett, she said, was completely supportive; when Tom leaves sometime in January he’ll move into another billet house. As always, the worst part about the time together is the leaving. With the Storm on a four-game losing streak, Kirk Brooks had seen enough and fired the team’s coach, Josh Hauge.16 No doubt many billet moms and dads sat around the table or in the living room that night with their players — their kids, their children, their boys — and offered quiet support and optimistic encouragement. Hockey, like life itself, is a brutal business, as mysterious as it can be rewarding. The billet families do what they can to build and maintain stability and humanity. Hauge had been hired less than two years earlier. There’s a USHL team outside Chicago — the Steel — and the Andersens are considering applying to be a billet family there once they themselves have finally reunited. It wasn’t too long ago that Deb Andersen couldn’t quite grasp having someone else’s kid come to live in her house. Now she can’t imagine life without one.